On 29 November 2003, the new St Patrick's Cathedral was dedicated. The historic St Patrick's Cemetery is located in North Parramatta. The Uniting Church is represented by Leigh Memorial Church. Parramatta Salvation Army is one of the oldest active Salvation Army Corps in Australia. Parramatta is also home to the Parramatta and Districts Synagogue, which services the Jewish community of western Sydney. ^ "Daily Maximum Temperature - 066062". www.bom.gov.au. Bureau of Meteorology. Retrieved 3 February 2016. ^ "Daily Maximum Temperature - 066124". www.bom.gov.au. Bureau of Meteorology. Retrieved 3 February 2016. ^ "St John's Anglican Cathedral". Heritage Branch. Archived from the original on 9 June 2011. Retrieved 15 July 2010. See also Reculver. ^ NSW, Infrastructure. "Infrastructure NSW : Western Sydney Stadium". Infrastructure NSW. Retrieved 25 October 2018. 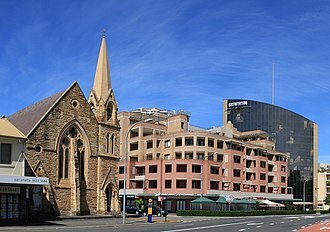 Wikivoyage has a travel guide for Parramatta. 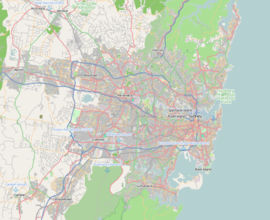 Wikimedia Commons has media related to Parramatta, New South Wales. Wikisource has the text of the 1911 Encyclopædia Britannica article Parramatta.